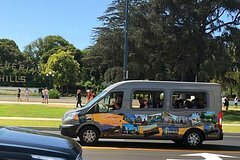 During the 2 hour duration our experienced tour guides will narrate the entire time while you visit Celebrity Homes, in Beverly Hills, stroll down world famous Rodeo Drive where your favorite celebrity shops. Drive up Mulholland Drive, view the iconic Hollywood Sign from The Hollywood Hills, visit The Sunset Strip, see The Whiskey A-Go-Go, The Viper Room & other famous Music Venues along the way possibly spot your favorite celebrity eating lunch outside one of the many famous restaurants on the strip. Visit The Walk of Fame, and see The Dolby Theatre where Hollywood hosts the annual Oscars ceremony, The Chinese theatre, Jimmy Kimmel Live, Madame Tussaud's, Paramount Studios, Capitol Records & Roosevelt Hotel. View The Rock Walk at The World Famous Guitar Center on Sunset where many famous musicians still shop for their music equipment to date. Learn about Filming Locations, Historic Venues, Celebrity Hot Spots & Historic Hollywood along the way.